Sitting still and paying attention – Young children (as I’m sure you know) do not have naturally long attention spans. They learn to increase their ability to sit still and pay attention by practicing. Engaging stories are ideal for providing practice in this area. Auditory processing – Children learn to listen to the words in the story and process their meaning. They can listen to details about the characters, the setting and the action in the story. They can practice listening for clues and making predictions about what will happen. They may process what is taking place in the story and relate it to their own experiences. Vocabulary enhancement – Children can learn new words and enrich their vocabulary by listening to wonderful children’s literature. Visual Discrimination – Children can gain valuable practice looking at the details in the illustrations of picture books. Over-sized books with large font (appropriately called “Big Books”) can also give children opportunities to see words repeatedly in print. Some of these common words then become sight words that children can read “on sight” without the need to sound them out. Children can also learn about the concept of a word as a group of letters separated by a space when looking at the text in Big Books. Hearing and sharing ideas – Discussions about the stories children hear create opportunities for children to share their ideas with others and learn to allow others to share ideas, as well. Reading picture books at home gives you the opportunity to read a book more than one time. Children love hearing a book over and over and feeling familiar with the text and illustrations. This is a wonderful luxury that I rarely had as a teacher, but one that gives you the chance to approach a book in a variety of ways. Reading from start to finish without stopping – Authors of young children’s books often take great care with the language and word presentation in their books. A particular rhythm is often established, and reading a book without stopping for discussion or comments can highlight this rhythm and add to the enjoyment of the story. Also, reading without stopping gives children the chance to “jump into the story” themselves and become fully immersed in the action. Pausing to comment, answer questions or ask questions – There may be instances when clarification is helpful for a child and pausing to comment on a confusing point keeps the child engaged in the story. At other times, the adult reader may be curious about the child’s response to a character’s behavior or to a situation in the story, and having a quick conversation is appropriate. Asking questions or eliciting comments may also keep a child focused on the story, knowing that his responses will be part of the story-reading experience. Practicing skills – Some books provide wonderful practice with skills such as identifying rhymes, letter and number recognition, and counting. When reading these books, pausing on every page to give your child the chance to practice a specific skill is helpful. Often, in these instances, I first read the story from start to finish to give children the chance to enjoy the story line and illustrations. Then we go back and read one page at a time, stopping to practice the skill. For example, with rhyming books, you may choose to read the text, stopping to allow your child to fill in the missing rhyme. 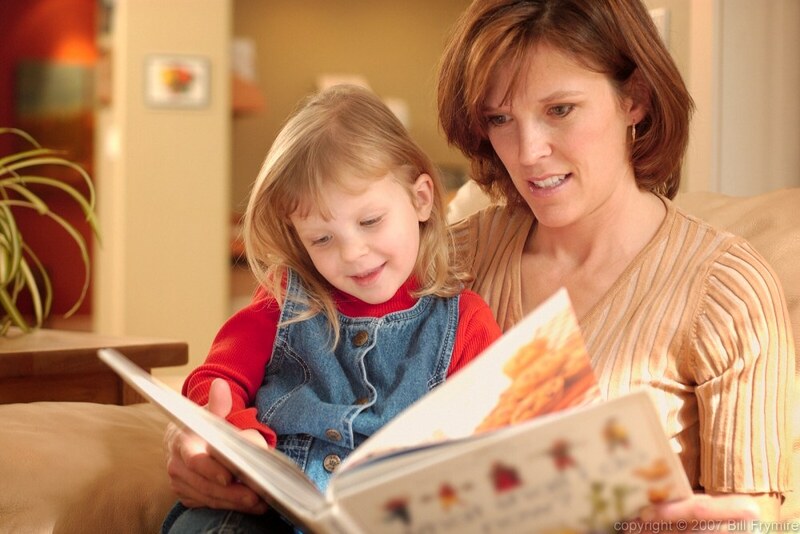 With counting books, encourage your child to touch each picture as he counts aloud. Follow-up discussions – Sometimes it is wonderful to simply read a beautiful picture book and enjoy it on its own. In other cases, where time permits, follow-up discussions can enrich the story. Sharing ideas about the characters, action or setting can stimulate a child’s imagination and problem-solving skills. Can your child think of another ending to the story or another solution to the problem presented in the book? Perhaps your child has had a similar experience to the one described in the story and wants to talk about his feelings in this regard. Your child may simply enjoy sharing his ideas (his favorite illustration or part of the story, for instance), knowing that he has your undivided attention. Visit Renee at www.schoolsparks.com for information on helping your child develop important school-readiness skills. On her site you’ll find a free kindergarten readiness test plus hundreds of free kindergarten worksheets. My kids love picture books. Thanks for sharing this, Renee! I’m impressed, I must say. Really rarely do I encounter a blog that’s both educative and entertaining, and let me tell you, you have hit the nail on the head. Your idea is outstanding; the issue is something that not enough people are speaking intelligently about. I am very happy that I stumbled across this in my search for something relating to this…..
Joey, thank you for visiting us! I hope you return again soon.